Cleo Coyle certainly does not write the same story over and over again. In fact, with the latest Coffeehouse mystery, Clare Cosi is caught up in politics, murder and crime in Washington, D.C., quite a departure from the usual New York City setting. 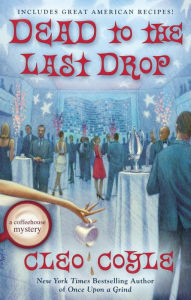 The change in setting and atmosphere means Dead to the Last Drop is perfect for readers just discovering Coyle as well as those of us who are addicted to the coffeehouse atmosphere, characters, and books. Clare Cosi, coffeehouse manager and master roaster, is delighted to spend time in DC opening a second Village Blend location for her beloved ex-mother-in-law and employer, Madame Dreyfus Allegro Dubois. It gives her the chance to spend time with her boyfriend, Mike Quinn, a NYPD detective who has been in DC on a special assignment for the Justice Department. However, neither Mike nor Clare thought they would end up on the run, hiding from the Secret Service, the FBI, and other law enforcement agencies. As the two try to puzzle out the answers as to how they ended up as fugitives, Clare relates her side of the story to Mike, beginning with the unexpected problems at Village Blend. She had a temperamental chef, a menu that failed to interest diners, and a surprising guest performer in Jazz Space, the coffeehouse's second floor jazz club. Who knew the President's daughter was a jazz virtuoso on the piano? Maybe the State Department staff member who collapsed on the floor in the club knew secrets that lead to Clare's problems. And, Mike has problems of his own, problems that make it no easier for Clare and Mike. With a residence in a historic mansion, and the opportunity to open a new coffeehouse and jazz club, Clare's temporary stay in D.C. should have been an experience to remember. Instead, Clare's good fortune turns into a nightmare. Because Cleo Coyle's mysteries are set in a coffeehouse and include recipes, people may mistakenly think of them as cozy mysteries. I've said before, they are not. There is nothing cozy about the crimes and politics in Dead to the Last Drop. This book, and the others in the series, feature well-rounded characters involved in intriguing mysteries featuring contemporary crimes. The D.C. setting is described with as much detail and affection as the New York City settings in the previous books. And, the jazz club storyline and musicians add an enjoyable musical flair to the plot. Best of all, Clare Cosi is a strong, independent woman, fiercely supportive of her family, including her Village Blend family. In fact, it's that affection that leads her into trouble time after time. But, with her intelligence, and the reciprocal support from her family and friends, she's able to deal with the troubles she encounters. Readers of previous books in the Coffeehouse series will discover answers to storylines left hanging in the last couple books. But, new readers shouldn't hesitate to pick up Dead to the Last Drop. Meet Clare Cosi, a strong amateur sleuth in a modern traditional mystery. Dead to the Last Drop by Cleo Coyle. Berkley Prime Crime. 2015. ISBN 9780425276099 (hardcover), 432p. Labels: Cleo Coyle, Coffee, Mystery Series, Washington D.C. This series just gets better and better with more depth and pizzaz. You're right, Libby. And, this one, with the jazz club has pizzaz! Hoping my library agrees to purchase this one, otherwise I'll buy it myself. Love this series. I've only read two in the series--Once Upon a Grind and (my favorite) Billionaire Blend--and I have the rest to look forward to. Lucky me! TFJ, I have a contest for a couple copies starting tomorrow!